Horde can find Shoak in Gloom Hollow after completing the quests, Killing Cannibals, Just Say No to Cannibalism and Shoak's on the Menu. To get this pet to appear on the vendor, Horde must first complete Torga's Eternal Return storyline, which then opens the quest chain that begins with To Gloom Hollow. 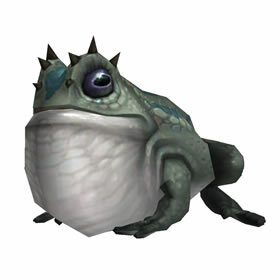 After saving shoak you need to unlock the pet by doing Krag'wa's Chosen and Vengeance of the Frogs. There has to be something else to unlock this pet. I've got Shoak unlocked on my horde alt but he doesn't sell it. These toads do not appreciate having their legs pulled off.